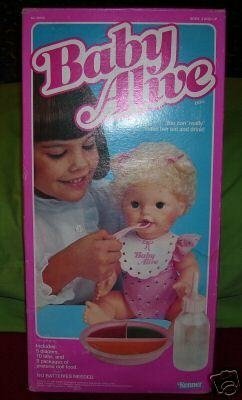 Baby Alive is a baby doll made by Hasbro that eats, drinks, wets and in some cases messes. Its mouth moves and is supposed to be lifelike, as the brand name suggests. 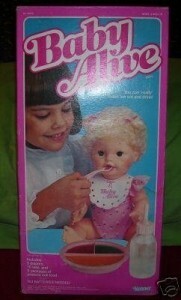 It was originally made and introduced byKenner in 1973, and reintroduced by Hasbro in 2006. Today, Baby Alive is offered in Caucasian, African-American, and Hispanic varieties. The newest versions include Wets & Wiggles (male or female), Sip ‘N Slurp, Sip N Snooze, Pat N Burp, Baby Alive learns to potty, and baby go bye-bye.